We all talk about 1:1 marketing, but few people are actually doing it. It is difficult. It is complex. But, it can be highly profitable and satisfying for the customers. Here is how one large British corporation went about developing 1:1 customer communications with the help of a very experienced US direct agency. British Telecommunications has been around for a century. It was originally part of the postal system in the UK. Privatized in 1984, BT now has twenty million customers, which represent 90% of the households in a country of fifty million. Until recently, they had no competition. That is not true anymore. In the 1990’s worldwide telecommunications competition came to Britain in a big way. They now have over 100 competitors. To promote retention, they decided to conduct quarterly mailings to the eleven million customers in their database on a regular basis. This is the story of how they went about it. To manage the operation, Nigel Grimes, head of the Direct Marketing Consumer Division for BT turned to Devon Direct, a full service direct marketing advertising agency located in Berwyn, PA. Devon has fourteen years in direct marketing focused on the telecommunications industry. Their clients include AT&T, Bell Atlantic and MCI. The goal of the BT program was primarily retention. In England, BT is like apple pie. Everyone knows it, and most people like it. But it is seen as older, stodgy and high cost. The newer competitors were primarily competing on price. They were targeting BT’s top customers. Unlike their competitors, BT offers a full line: local service, long distance, international, charge cards, Internet, call waiting, caller ID, return call. Faced with stiff competition, they decided to copy MCI and offer Friends and Family. The mailing piece created by Devon for the quarterly mailings is a variable text brochure containing from twelve to twenty four pages. Each page introduces a new product or service. The personal savings review and the order form are custom printed for each customer, based on the information in the database record, with a different offer and a different primary message. The main selling brochure is segmented into up to six versions which vary by customer. BT was mailing one million pieces a week, with considerable personalization. No one in the U.K. had the capability of producing this volume of customized communications, so they were printed in the US and airlifted to Britain for the mailings. In the package, BT was able to offer fully customized and personalized piece based on the information in the customer’s database record. The beauty of the personalized piece was that they were able to use the data in the database to make sure that every one of the million pieces mailed every week was different from every other piece. If the customers were already members of Friends and Family, the message would tell them what savings they were making. If they were not, it would encourage them to join. One page dealt with discount plans for which the customer was eligible. The page would tell the customer how much she could save per quarter by switching to a discount plan, based on her existing phone usage history. If the quarterly savings were too low, the text shifts to annual savings. If even that was too low, there would be no mention of the discount plan at all. BT offers a combination of up to 20 different services to their 11 million customers. If a customer already has one of the services, that is not offered. If a customer is not eligible for a service (because of low volume, for example), the service is not offered. The order forms are completely lasered, driven by customer data. It is made very easy for the customers. The US MCI Friends and Family plan asked customers to provide the names of the people they wanted in their calling circle. The BT system is different. 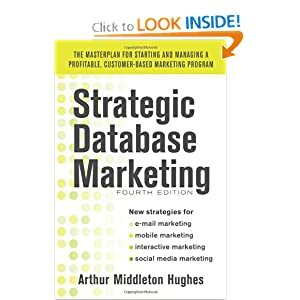 It begins with the customer database and provides the customer with the ten phone numbers that they call the most. They are asked “Is it all right if we include these in your calling circle?” It tells the customer, “I know your situation. I understand you, and want to help you.” It gives the customer a choice. Behind the scenes, BT has up to 80 text modules combined with up to 20 services, making up to 4,500 possible permutations and combinations of text in the brochures. It is impossible to proof. If you add more products to the offer, as product managers keep wanting to do, the number of possible combinations explodes. The careful checking of the software is critical. One of the main objectives of the BT quarterly mailings is brand reinforcement. BT is one of the few British companies that have not been bought out by the Germans, the Japanese or the Americans. They intend to stay that way. The brand says: trustworthy, good value, competitive, service oriented, and British. What has come about as a result of these unique and expensive quarterly mailings? A response rate of between 14% to 32%. In one mailing, one third of the 11.5 million targeted households actually responded to the mailing and bought one product or other. On the average, customers buy 1.5 products per response. The Friends and Family Customer Database is now in excess of 14 million, up from 1 million when the program began. These results have been greatly enhanced by an intensive telemarketing operation which takes both inbound and outbound calls. Why has it been so successful? Personalized based on customer data in the database. BT has been among the first to exploit the latest in personalization technology. The average UK household gets 44 items of direct mail per year. The average US household gets more than 700 pieces per year. The UK is still virgin territory. This information should be studied by any US company that wants to invest in direct mail in the UK. The profit potential is definitely there. With response rates like this, direct mail in Britain should be high on any US marketer’s to-do list.